Luis is a little concerned when the electricity goes out in his house in Hampton, NJ, but he heads off to school. The power is out there as well, but he runs into his friend Maura and decides to spend the day at her house in the suburbs. When they arrive, they find that Maura's grandfather, Mr. O'Hara, has had a stroke, at just about the same time the power outage occurred! He ends up in the hospital, and with no electricity to charge phones, pump gas, or to support so many other crucial functions, things get hectic. Luis' parents can't go to work at their jobs, either, and as the power outage continues, tensions run high in the town, spurred on by the outspoken candidate for mayor who blames the incumbent for the outage.. Luis frequents a local bodega, and the owner, the diminutive Senora Alvaro, is almost attacked by rampaging teenagers, but Luis manages to keep her safe. After this, he decides to hunt down a local homeless man know as Computer Genius to see if he might know what caused the power outage. Computer Genius is willing to help... for a price. Luis and his friend Carlos find Red Bull and Pringles for the hacker, and Carlos is dispatched to help Senora Alvaro. When Computer Genius seems to be getting close, Luis finds himself followed by guys who seem intent on beating him up, but he insists on staying in town even when his parents want to decamp to a relatives house. Who is behind the power outage, and will Luis and the Computer Genius be able to restore power before things in Hampton get even worse? Strengths: I love the quote with which this book starts: "We live in a society exquisitely dependent on science and technology, in which hardly anyone knows anything about science and technology. This is a clear prescription for disaster." Carl Sagan. Books like Weyn's Empty, Philbrick's The Big Dark, Pfeffer's Life as We Knew It, and Walters' The Rule of Three are so utterly chilling because they could so easily happen. 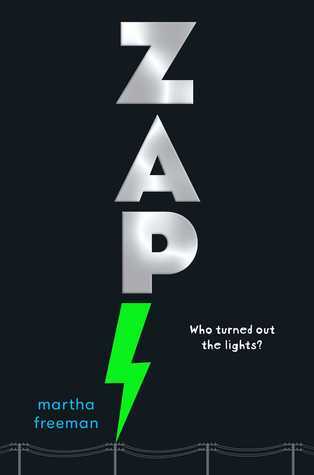 In Zap, the outage is localized and due to some easily explained but scary politics, and the science and technology used to explain the outage is utterly realistic. Told from Luis' point of view, we see his tween irritation against the larger issues, and it's a twist on "tweens saving the world" to have him investigate in ways that adults don't pursue. The inner city setting contrasted with Maura's new home in the suburbs speaks to many current issues in our society, but it's good to see that the two remain friends. Young readers will be enthralled with Luis' exploring of abandoned houses. There were just so many things I liked about this book! It was an intriguing read. There are also some great science connections on electricity! Weaknesses: While I liked the fact that Luis is the son of Nicaraguan immigrants, I was a bit worried that this wasn't an #ownvoices book, especially when Luis talks about having to clean up his parents' vomit after their "well deserved" partying. However, there is a note at the end from a friend of Freeman's who grew up in a similar setting, and he apparently gave her notes on what it was like to live in a similar time and place. Aside from that alarming description, the parents are hard working and treat Luis well, although it was a stretch to me that an 11 year old would be left behind by any parents during a power outage. I wish that Luis had been 14 or 15, since the book would then appeal to high school readers as well. I also wasn't entirely comfortable with how the role of the grandfather was treated. What I really think: Clearly, I need to stock up on bottled water. And peanut butter. Can't wait to purchase this and share it with my students. Ms. has read 0 books toward her goal of 810 books.